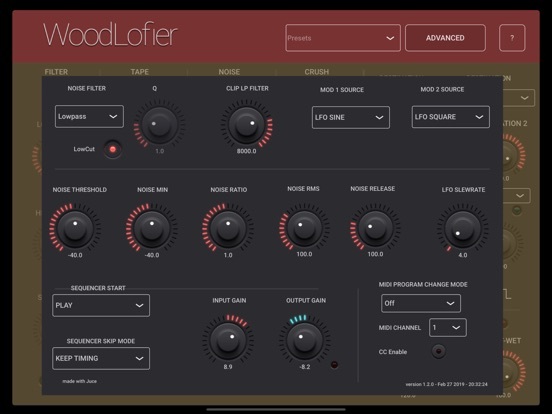 The WoodLofier is both a standalone app and AUv3 plugin which combines 4 different sections to make your sound more lofi or to add some creative twist : filtering (and Sample Rate reduction), a Tape wobble unit, Noise addition and Crushing (clipping, bit reduction and saturation). 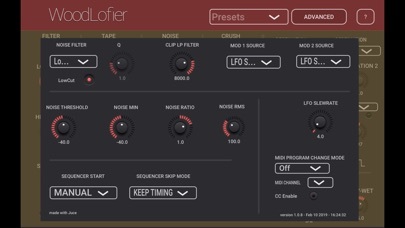 It also has 2 LFO’s to modulate several parameters to bring more life/variation in the mix. And it has a built-in 8 steps sequencer which allows to save/recall all the available parameters per step. - Has input low cut and high cut filters. - Has a sample rate reduction unit. - Has a tape wobble unit. - Has a signal dependant noise addition unit. 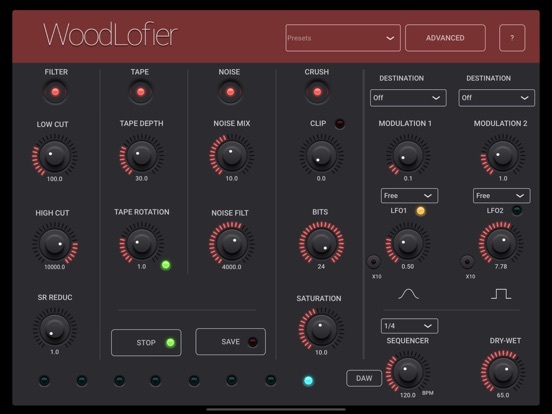 - Noise color can be set with a LP/HP/BP filter. - Noise levels can be set with 5 advanced parameters. - Number of bits per sample can be set. 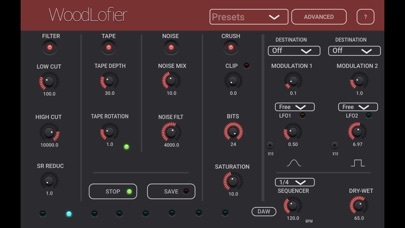 - Has a clipping unit with auto gain and a lowpass filter for heavy distortion. - Has a more subtle saturation unit. - Has an 8-steps sequencer : each step can save/recall all the parameters. - Sequencer can be started manually or started when Playing (transport) starts. - Sequencer has a convenient beat/bar timing popup. - Modulator destination can be tape rotation, tape depth, noise level, clip level or input amplitude.